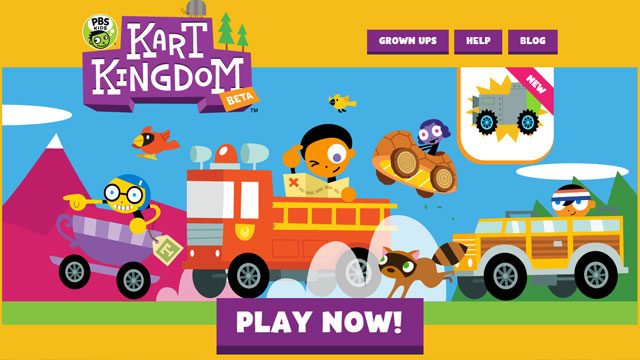 PBS KIDS today announced the launch of Kart Kingdom, the children’s media brand’s first-ever online world. Now available at pbskids.org/kartkingdom, Kart Kingdom features a collection of fun, curriculum-based games that help kids ages 6-9 learn systems thinking skills. The game also helps children build collaboration skills as they work together to create gadgets and unlock rewards for the entire Kart Kingdom community. In another first, PBS KIDS’ Kart Kingdom features a new junior edition of E-line Media’s Gamestar Mechanic, which allows kids to create, play and share their own digital games. PBS stations will bring Kart Kingdom into the community with live game events across the U.S. starting this spring. As kids navigate Kart Kingdom, they complete quests in their customized karts, gathering resources along the way that enable them to craft gadgets that help them further explore the world. Throughout the experience, players collaborate to craft new items for their avatars and karts and to complete community events that unlock new rewards for all participants. 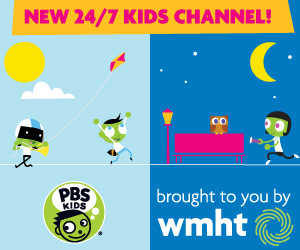 As part of the adventure, kids can also play games with characters from their favorite PBS KIDS series, including WILD KRATTS and THE CAT IN THE HAT KNOWS A LOT ABOUT THAT! With Kart Kingdom’s Gamestar Mechanic Jr. game, young learners have the chance to create their own video games, which other kids can play. Developed by PBS KIDS with curriculum advisors from Arizona State University’s Center for Games and Impact and funded by the Corporation for Public Broadcasting (CPB), Kart Kingdom helps kids develop systems thinking skills, which are essential to solving complex problems that affect all areas of their lives. Systems thinking skills enable kids to realize the connections and interactions between elements that compose a whole system, and to strategize about how they would optimize the system interactions to more effectively reach important goals. “Kart Kingdom expands on public media’s commitment to finding innovative ways to engage children in learning anytime, anywhere,” said Debra Sanchez, Senior Vice President of Education, CPB. “Educational online games that support exploration and skills like systems thinking can help kids understand how their actions and interactions can impact their environment,” said Sasha Barab, Professor and Executive Director, Center for Games and Impact, Arizona State University. “Kart Kingdom’s curriculum-based games help kids to engage and collaborate, and use critical thinking skills as they quest and craft their way through an innovative online world." PBS stations will bring Kart Kingdom to life with events based on the game’s curricular focus in communities across the country later this year. Designed to help kids build systems thinking skills, the station events will feature live games that kids can play together and that can be customized for each local community. Kart Kingdom is currently available as a browser-based game and will be available for iPad and Android tablets this summer. Personalization: Players can customize their avatars and karts at the “parts booth.” As players complete quests and play games, they earn more options to choose from. Social Spaces: Kart Kingdom includes four environments to explore – “The Deep,” “Grand Glade,” “Bug Garden” and “Mount Snow.” Within each area, there is a social space, where players can see and interact with each other using a safe, preset chat system. Kids are also encouraged to take part in activities that model collaborative online behavior, such as crafting karts, kart parts and gadgets together and community events that require multiple users to work together to earn rewards. Quests & Crafting: Kart Kingdom players are given quests to search for objects and animals connected to the world. Quests take place in large exploratory areas based on real-world places such as forests, oceans and a child’s own backyard. To complete quests, players must use items they find and earn to craft “Kart Gadgets” that allow them to reach new places and overcome challenges. Educational Games From PBS KIDS Shows:Kids can play games from their favorite PBS KIDS series, including WILD KRATTS, THE CAT IN THE HAT KNOWS A LOT ABOUT THAT!, FIZZY’S LUNCH LAB and PLUM LANDING. Gamestar Mechanic Jr.:Produced by E-line Media, Gamestar Mechanic Jr. helps kids learn the principles of game design and problem solving through an exciting adventure game. As kids progress through Gamestar Mechanic Jr. quests, they earn “sprites” that enable them to design and publish their own games. The game also features a vibrant community called “Game Alley” where players can publish, play and provide feedback on games designed by other players. Gamestar Mechanic Jr. is based on the award-winning Gamestar Mechanic, which has been used by over 700,000 youth to make over a million original games.